This 59 hectare park along the spectacular Strait of Juan de Fuca offers beautiful trails, whale watching, secluded campsites and waterfront picnic areas. Imagine loving to travel so much, you would walk across Canada! Imagine falling through the ice in the Northwest Territories, losing to frostbite all the toes off one foot and the heel of your other, thanking aboriginal knowledge that you did not lose more! Imagine not stopping there, traveling by boat and canoe down the Bulkley Valley to Vancouver, and then paddling around Vancouver Island to find your future home! It took pioneer James French two adventurous years to travel from New Brunswick to Victoria. He pre - empted the land west of Sooke in 1885. French was an early naturalist, traveling the world to bring exotic animals to zoos for public enjoyment and education. After an expedition to Africa, French once brought home a small elephant shortly before selling it to the Woodland Park Zoo in Seattle. For information on reading PDF files, click here. French died in 1952, survived by his family who continued to live on the property and play an active part in local logging. French had hoped that a much larger section of the west coast of Vancouver Island would be made into a provincial park. His home and favourite beach would become French Beach Provincial Park in 1974...twenty years later, Juan de Fuca Provincial Park would further his dream. French Beach lies within the traditional territory of the T�Sou-ke First Nation. Their economy was based on hunting, fishing, and gathering, extended families among the Straits people owned the lands and resources which could not be sold but inherited. Situated on the straits of Juan de Fuca. This 59 hectare park is situated on the Strait of Juan de Fuca 5 km east of Jordan River. Beautiful hiking trails lead you through second growth forest of Douglas fir, Ditka spruce, western hemlock and western red cedar to the beach. You will also find salal, Oregon grape, and evergreen huckleberries, and a large variety of ferns along the trails. Once on the beach, there are excellent whale watching opportunities. These magnificent animals migrate to northern feeding grounds in the spring and return south in the fall. French Beach is also and excellent location to observe seabirds, bald eagles, and ospreys. Otters, seals, and sea lions can also be seen playing offshore. French Beach is located near the northern edge of the Olympic Peninsula rain shadow and receives more precipitation than Victoria but much less than areas to the northwest such as Port Renfrew or Bamfield. Killer Whales and Grey Whales have often been observed swimming past the beach or feeding just off the points. The best time to see Grey Whales is during their migration from the Mexican coast to Alaska during March and April. Both California and Northern Sea lions can be found here from late August through May. Harbour Seals are often seen offshore, they can be recognized by their basketball-shaped heads bobbing at the surface. 69 campsites. Reservations are accepted. There are some first come first served sites. Pit toilets. No showers. No electrical hook-ups. Picnicking/day-use area with and adventure playground and picnic tables. There is a 1 km walking/hiking trail throughout the park to view the second growth forest. There is a sani-dump station located on Highway 14 across from the park entrance. Saltwater fishing. All anglers must have valid fishing license. Refer to BC Environment Fishing Regulations and Sport Fishing Regulations. There is no beat launch located at this park. Interpretation programs are intermittently run during the summer months ( July to September). Please check the park information shelters for program schedules. These programs are sponsored by the Park Facility Operator. BC Park Recycles! Please place your tines, bottles, and newspapers inappropriate containers located throughout the park. 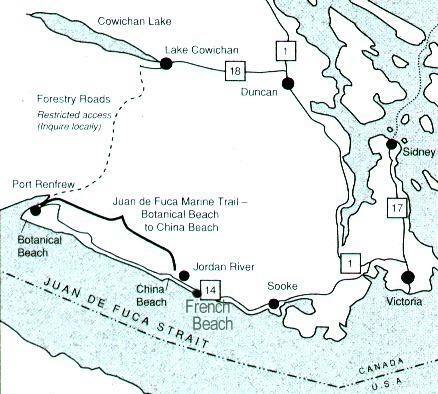 Thirteen kilometers northwest of French Beach is the Juan de Fuca Marine Trail. This 47 kilometer wilderness trail, stretching from China Beach to Botanical Beach, offers day or multi-day hiking and viewing opportunities. The communities of Jordan River, Shirley, and Sooke provide restaurant and other services for French Beach visitors. Visitor information centers are located in Port Renfrew and Sooke. BC�s parks belong to you. Park regulations exist so residents and visitors will always be able to enjoy protected natural landscapes. Regulations are posted at park kiosks or are available from park headquarters. Reservations: - a selected number of sites are reservation, call 1-800-689-9025 ( in Vancouver, call 65-89-9025). Quiet time is from 10 PM to 7 am. Please do not operate noisy equipment or generators. Loss of property - Please lock all valuables in your vehicle. Never leave valuables in your tent or unattended. All losses should be reported to the park staff or the RCMP as soon as possible. Pets must be kept on leashes. Owners are responsible for picking up pet droppings and disposing of same in garbage containers. Campfires must not exceed 0.5 meters in size. Leaving a campfire unattended is a serious offence. Fires must be extinguished before retiring or leaving your campsite. Trees - Small trees and shrubs are easily damaged. Do not use them for wiener sticks or clothesline supports. This park offers vehicle accessible campsites. Campsite reservations are accepted and first-come, first-served sites are also available. Fees, hours of operations, and number of campsites. No wilderness, backcountry or walk-in camping. There are group campsites at this park. Click here for reservation information. Some facilities and hiking trails in the park are wheelchair accessible. Contact the District Office for more information. Please Conserve Firewood. Campfire pits are provided at most campgrounds. Limited burning hours may be in effect at some parks and fire bans may be implemented during extremely hot weather conditions. Be prepared to bring a portable stove for cooking. There is a 1 km walking/hiking trail throughout the park to view the second growth forest. For your own safety and the preservation of the park, obey posted signs and keep to designated trails. Shortcutting trails destroys plant life and soil structure. The adventure playground at French Beach provincial park is temporarily closed due to an unsafe broken part of the playground. There is no date as to when the playground will again be available for use. There are no lifeguards on duty at provincial parks. This park is located on the Pacific Ocean. The water is very cold. Bring good footwear as you can walk along the sand and gravel beach watches the ocean waves. Canoeing and kayaking is not recommended due to the strong ocean currents. Saltwater/ocean fishing. Anyone fishing or angling in British Columbia must have an appropriate license.